Farms are inherently dangerous workplaces. Farmers and farm workers are more likely to be seriously injured or die at work than other Victorians. The farming industry employs about 3% of the Victorian workforce, however it accounts for approximately one-third of workplace deaths across the State. 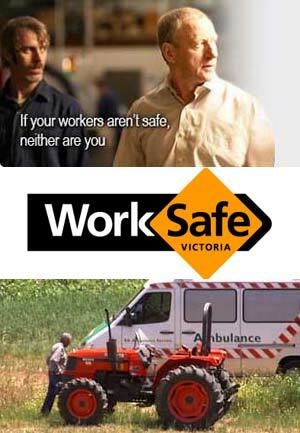 Farms are amongst the most dangerous workplaces in Victoria. The work is heavy and awkward, and it can involve working alone as well as long hours. Accident records show there is a high risk of death, injury or illness to workers and others on the property such as visitors and children. Farm risks include tractors and their attachments (particularly power-driven attachments) which cause most of the deaths and severe injuries, however unguarded conveyors, farm machinery and all-terrain vehicles have also caused severe injuries. The vast majority of injuries are less serious such as muscle strains from forceful or repetitive lifting, carrying, pushing and pulling. Other dangers faced by farmers and farm workers include falls, slips and trips, lacerations, contact with electricity, depression, fatigue, sun exposure, noise, working in confined spaces and illnesses associated with chemical use. The Horticultural Safety Guide has been developed to help improve Occupational Health and Safety on your property. the guide shows how you can control the hazards on your property and improve safety in your workplace. Picking, planting and packing vegetables involves many repetitive, manual activities which can lead to injuries needing medical… Go to article. Agricultural and veterinary chemicals are used to protect crops, livestock and other animals and plants from unwanted… Go to article. Through smart and efficient farming practices, Victorian farmers produce a variety of foods crops widely regarded… Go to article. Australia has a large number of species and ecological communities that are under threat of extinction, mostly… Go to article. Noxious weeds and pest animals can cause a range of serious problems by impacting on human and animal health, biodiversity,… Go to article. a land of opportunity that had been referred… Go to article. Occupational Health & Safety is a major issue for Australian agriculture. Work related injuries, payouts and fines… Go to article. The Vegetable Growers� Association of Victoria is proud to support a great new initiative that encourages all Victorians… Go to article. The Vegetable Growers’ Association of Victoria has called for a review of horticultural water licensing in the Port Phillip and… Go to article. Growers in the Werribee Irrigation District have received a helping hand as they struggle to stretch their scarce water supplies… Go to article. Nutritionists at Edith Cowan University have found… Go to article. A new project run by the Victorian Farm Safety Centre, will… Go to article.